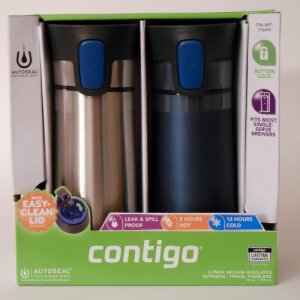 Contigo Vacuum Insulated Autoseal Travel Tumbler Set Blue/Chrome  - $16.00 : Big City Market, Big City Market Delivers it All! These stylish travel mugs feature one-touch AUTOSEAL® lids that automatically seal between sips to eliminate messy leaks and spills. Simply press the button to drink, release to seal. The travel mugs provides convenient, one-handed drinking for both left- and right-handed users, and fit most car cup holders and single-serve brewers. The double-wall vacuum-insulated body is engineered to keep drinks hot for up to 5 hours and cold for up to 12 hours. For easy cleaning, the dishwasher-safe lid hinges open for full access with no loose parts to clean, lose or reassemble. Lifetime Guarantee.